Matthew Rea was among Ballymena's try scorers in Saturday's defeat by St Mary's. Picture: Press Eye. Ballymena Rugby Club’s unbeaten start to the Ulster Bank All-Ireland League Division 1B campaign came to an end at the weekend. 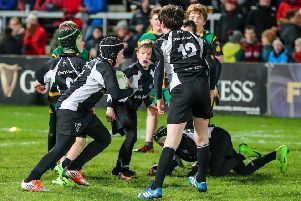 Over the years Ballymena have enjoyed little success at St Mary’s Dublin home, and Saturday’s game proved no different with the visitors coming out on the wrong side of a 16-18 score line. On yet again a perfect day for rugby, St Mary’s took an early lead after three minutes with a Sean Kearns penalty, and the next period of the game saw both sides on the attack, but with defences holding firm. On 15 minutes Ballymena were awarded a penalty in an eminently kickable position, but instead opted to kick for the corner and set up the drive. David Whann took the lineout catch and the pack drove for the line, but it took seven attempts by the forwards before the home defence was breached and Matthew Rea went over for the try, which was not converted to give them a 5-3 lead. From a scrum on half way, Ballymena moved the ball left, and with a clever long pass Marty Irwin created space for Rodger McBurney , who set off on another of his mesmerising runs, running fifty metres and wrong footing the home defence for the best try of the day which was not converted. Almost on the stroke of half time Kearns kicked a penalty, so the teams changed ends with the visitors enjoying a slender 10-6 advantage. St Mary’s started the second half with greater intensity and after three minutes a high ball was fumbled by the Ballymena defence. Sustained pressure and good ball retention eventually created the opportunity for scrum half Glynn to dart over for a try, which Kearns converted to put St Mary’s into a 13-10 lead. Ballymena’s reply was to score another great team try, initiated by a McMaster pass which gave Jonny Rosborough room on the outside. He made ground and when the ball was recycled Glenn Baillie took the pass and cut through the home defence. His grubber kick ahead was taken over the line by the full back, and from the five metre scrum great work by the back put Alan O’Connor over for a try which again was not converted. When McMaster dropped a goal to create a five point gap, it looked as if Ballymena might pull off that long awaited win at Templeville Road, but a Kearns penalty put his side two points clear, and more pressure on the Ballymena line, leading to a late try by prop Tommy O’Reilly was enough to secure the victory.